Drones first came into the public's consciousness after military use, but they are rapidly being adapted for peacetime roles. Aerial photography and crop dusting are only the beginning. Amazon, Google and others are feverishly working toward product delivery drones in an effort to eliminate normal couriers. 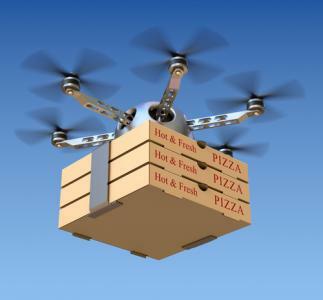 The key question to answer though is whether a drone could bring a pizza to a 14th floor apartment or office building and how that might work. After all, no one wants their cheese to slide off the pizza. Experiments at the mechanical engineering labs at Stanford University are seeking answers by studying how geckos climb. Most of us think of geckos primarily as insurance salesmen, but in reality, they are skilled climbers (sticking even to completely slick surfaces like a window). This climbing ability comes from the structure of their feet which have pads that alternately stick and release. It turns out that gecko feet have special characteristics and by mimicking them in robots, scientists have made drones capable of landing anywhere. Super cool, but also a little creepy, depending on what the drone is doing and whether it has a camera. Similarly, banks trying to onboard loans in this enormously competitive environment are having a tough time. This is especially true when banks want those loans to stick and neither glue nor suction cups seem to help. Many banks tell us that quality credits are traded back and forth between competing banks in town, with a lower coupon each time refinancing occurs. For those banks seeking to augment their direct origination efforts, we suggest participations of loans including C&I from large national or global companies. For bankers interested in this, like scientists looking to the characteristics of the animal world, some research is needed. To begin, these loans give bankers a way to quickly purchase C&I credits to fill lending holes, use up excess liquidity, diversify away from CRE or build up floating rate assets in preparation for Fed rate hikes down the road. To do this, start by reviewing the regulatory guidance released in 2013 around such loans. Be sure policies, procedures and limits are in place and as with other loan sectors, that you have a clear limit as to overall percent of capital you want to do in the aggregate. At the highest level, the key here is to zero in on loans that have total debt to earnings before interest, tax, depreciation and amortization (EBITDA) of < 6x. Once that is completed, it is also important to understand current market dynamics. Low market yields overall and strong demand worldwide for all assets have also impacted this sector. As with many assets right now, there is an imbalance between supply and demand, as demand outstrips supply. That means prices can range from $100 to as much as $102. If your bank would like to look into purchasing C&I loans, PCBB is your experienced partner. Our program screens loan offerings with bank regulations in mind and we also help your lending team by providing an underwriting jumpstart package and experts to help with the nuts and bolts of the process. While these loans won't yet be delivered via a gecko-modeled quadcopter drone, we will make certain to provide you the most natural and efficient means possible to help your bank find suitable credits. Give us a call for more information on how C&I can assist your bank in meeting its loan growth targets. Treasury yields rose 6bps as euro-zone consumer prices beat forecasts, injecting the market with fresh optimism. Yields are up 2bps this morning ahead of ADP employment data. Accenture research of global professionals finds the top challenges leaders face today are information overload (55%) and rapidly evolving technology (52%). CIO reports hackers have developed a way to hijack routers when users visit compromised websites or view malicious advertisements in their internet browsers. The attacks load code designed to determine the router models and then replace the DNS servers configured on the devices. This allows hackers to intercept traffic, spoof websites, hijack search queries, place fake ads on websites, etc. Experts say servers must be updated manually and users should check manufacturer websites for firmware updates for their router models and install them. Further, they recommend that if the router allows it, technical teams should restrict access to the administration interface to an IP address that no device normally uses, but which they can manually assign to their computer when they need to make changes to the router's settings. A deeper dive into the Q1 FDIC data finds 83% of the $37B earned by the commercial banking industry came from banks $10B or larger in assets and 10% came from banks $1B to $10B. Looking at the income components, the industry overall is running at about 63% net interest income and 37% noninterest income. By asset group: banks under $100mm (79% NII; 21% noninterest); $100mm to $1B (77%, 23%); $1B to $10B (75%, 25%); $10B+ (60%, 40%). A September 2014 Ponemon Institute study finds that 43% of executives surveyed said they had a data breach in the past year vs. 33% who said so the prior year - a 30% increase YOY. Nielsen reports the percentage of consumers for each channel used more than once in the past 30 days during the first part of 2014 was online (82%); ATM (68%); branch (68%); mobile (36%) and call center (28%).